Every year since its launch in 2015, I’ve attended the Bay Area Book Festival in downtown Berkeley. I love it, not because of my bookworm ways but the festival’s theme fits the values I hold dear to my heart. It’s a socially conscious event loaded with books and speakers focused on literary activism. This includes topics like tolerance, environmentalism/climate change, lack of gun-control, our nation’s political extremism, sanctuary and human rights. The entire event is based on changing the world for the better. Most every topic had a place within the words in my novels. This is Contemporary Realistic Fiction. It’s who I am. It was an exhilarating yet exhausting experience. We stood eight hours each day in our 10×10 booths with our books, flyers, author cards and whatever items we mustered up to pull in emotional heartstrings and open minds. We could hear each other’s marketing pitches all the way down “Author’s Aisle.” It was a throwback to my corporate days in a cubicle or at a trade show where we could also hear each other’s slick sales personalities. My booth mates’ snoopy dog and the jar of candy I used to help secure flyers in the wind attracted children—lots of children. It turned out to be a blessing because where children wander, parents follow. I signed and sold books, but that’s not what’s important. The public face-to-face contact and getting my author platform into the light of day in the sunshine and fresh air were magical. Rather than be rendered to a data point on Amazon or even physically shelved on Barnes & Noble and other bookstores (as my novel is) I am a voice in the crowd—a woman’s voice— which indirectly covers an additional main topic of this event: Women’s voices cannot be silenced! Over the past four years, I attended fabulous speaker panels at the Bay Area Book Fest. Not this year. My author booth took priority. Yet, I lived vicariously through many attendees and enjoyed their perspectives on the speaker engagements, hearing at least a handful equate the topics to my writing. 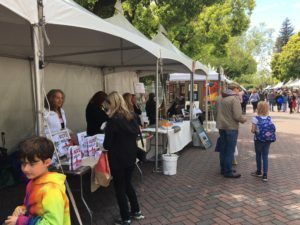 I couldn’t be happier with my experience as an author exhibiting at the Bay Area Book Festival. The best part was the human touch in marketing, rather than some digital algorithms determining if my voice in novels is worthy. Human touch, after all, is what I write.